One of the fastest growing and spreading ground cover plants Gazania are drought tolerant and free flowering. Also known as the ‘Treasure Flower’ they come in a range of flower colours and combinations. They grow well in full sun and cope with poor soils. It is mostly colourful hybrids that are offered by wholesale growers. Well suited to mass plantings in broader landscaping projects, they are low care and low maintenance plants. Landscapers find use for them as mass bedding plants, as container plants as well as for growing as hardy ground cover plants. For mass planting plant tubestock at around 20cm apart for a good dense cover over time. Many new cultivars are sterile which removes the problem of self seeding that is common with the species. Quick to form a nice rounded mound they look great in the border, rock gardens as well as in containers and for roadside plantings. 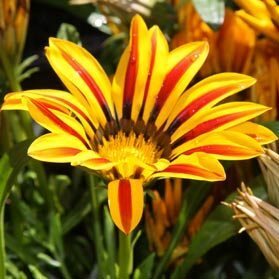 Gazanias will grow well in all but tropical climates. Most wholesale growers offer a range of Gazania tomentosa hybrids is sizes from tubestock through to 140mm pots and sometimes larger.